Evergreen Bunching Onions produce clusters of long, slender onions that can be separated. Tasty in soups, salads or as a garnish. Late plantings will over-winter for spring harvest. 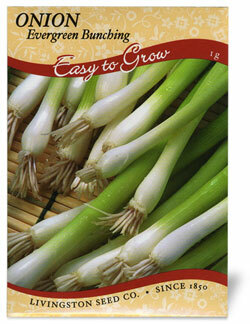 Garden Tip: Harvest green onions when the stems are pencil sized. These are called scallions.